Right now we are waiting for new Catriona CAMPBELL Wildlife Art to arrive at the gallery. In the meantime, here is a wider selection of the artist's work featured at the Red Rag Modern Gallery. 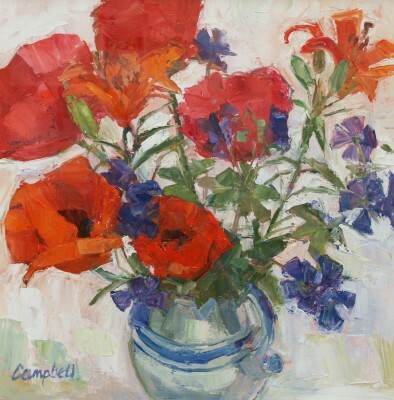 Catriona Campbell was born in Dollar, Scotland in 1940. Her father, Ian Campbell, was an artist and art teacher and he taught Catriona the importance of observation and the absolute necessity of developing drawing skills. 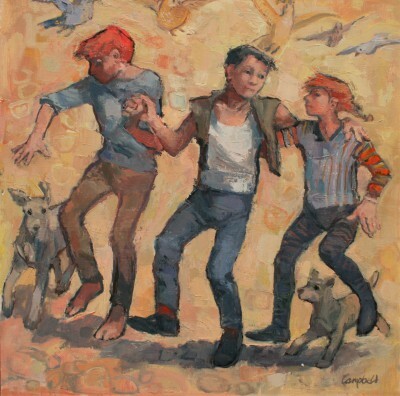 Catriona Campbell studied art at Glasgow School of Art from 1957-61. She was a student of David Donaldson and Mary Armour. She studied the art works of Degas, Uccello, Velazquez and Stanley Spencer and learned about how shapes and the spaces between them are vital to composition. The paintings of Scottish artist Joan Eardley also made a deep impression on her. She was awarded The Somerville Shanks Prize for Portraiture in 1959 and graduated in 1961. 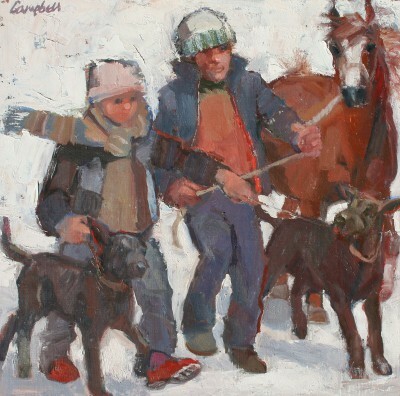 Catriona Campbell combined teaching in various primary and secondary schools and then in special education in Edinburgh and Fife with bringing up two children and finally left teaching in 1981 to become a full time painter. 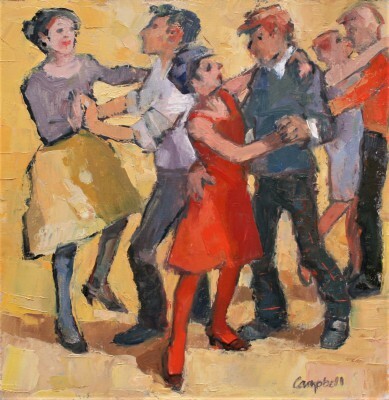 Catriona Campbell paintings display a continuing passion and interest in figure painting. She is an excellent observer of human situations. She also has a love and knowledge of horses, which often inform her subject matter. She works mainly in oils producing paintings rich in colour and depth. Catriona Campbell has won a number of awards including the Founder's Prize and the Anne Redpath Award from the Scottish Society of Women Artists, and the Morton Fraser Award from Visual Arts Scotland. She was elected a professional member of the Scottish Society of Women Artists (now re-named Visual Arts Scotland) in 1986 and subsequently a professional member of Paisley Art Institute. In addition to Red Rag Art Gallery Catriona Campbell art work has been exhibited at other leading Scottish Art Galleries including: the Royal Scottish Academy, The Royal Glasgow Institute, The Society of Scottish Artists. She has also exhibited at the Royal Society of Portrait Painters in London. Her paintings are held in both public and private art collections in the UK, Canada, USA, Australia, New Zealand, Spain and Hong Kong. Each painting at Red Rag is sourced from the Catriona Campbell artist studio and like all Red Rag Modern art and Contemporary art it can be shipped worldwide.